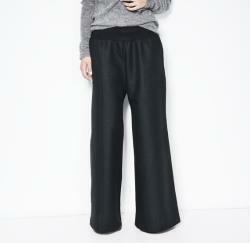 These wide linen pants make for a breezy and whimsical style. Wear them with a tight shirt to accentuate the loose cut of the pants or an oversized sweater for a casual look. The wide jersey band at the waist makes the pants quite flexible with the sizing and even eligible for the first months of pregnancy. The pants come with a linen belt. Size chart (based on body measurements). Xsmall (0-2) 33 / 25 / 35. Small (4-6) 35 / 27 / 37. Medium (8-10) 37 / 29 / 39. Large (12-14) 39 / 31 / 41. Xsmall (eu 32-34 / uk 4-6) 83 / 62 / 88. Small (eu 36-38 / uk 8-10) 88 / 67 / 94. Medium (eu40-42 / uk 12-14) 93 / 72 / 99. Large (eu 44 / uk 16) 99 / 78 / 106. Turn garment inside for better washing results. Thank you for choosing our designs we are honored to create them for you with love and care. Look good and do good with marcella's designs: 5% of our profits are donated to unicef, makig the world better for kids. More than $3,500 have been donated so far thanks to your support and appreciation of our designs.